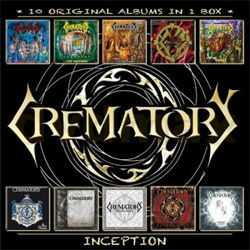 With a new album ‘Antiserum’ due in February ‘Inception’ wraps up Crematory’s ten studio releases from 1993’s debut ‘Transmigration’ to ‘Pray’ which came out in 2008. The fifteen years that mark this collection saw Crematory grow from a fairly extreme – or at least seemingly unsubtle – death metal outfit with exhilarating goth tendencies to a deftly creative goth metal band with industrial tendencies, and this paradigm shift becomes more apparent as you flit from disc to disc. It’s almost impossible to do such a set justice without going through it disc by disc, but highlights certainly include the guitar-driven comeback album from 2004 ‘Revolution’ with its chainsaw guitars and dance beats (c’mon, if you don’t like ‘Tick Tack’ there’s little hope for you), the wonderful ‘Act Seven’ from 1999 when to many the band seriously hit their stride, and personal favourite and tail-ender ‘Pray’. OK, so some metal purists won’t get past Felix’s cookie monster vocals but hey, they add light and shade to the mostly ‘clean’ chorus lines and without them, well, we wouldn’t be talking about this band anyway. The ten discs come in cardboard slipcases at a ridiculously cheap price, and if I wanted to be a party-pooper I would say that a brief booklet charting the band’s history would have completed the package beautifully. But with 100 or so songs on offer the set stands as it comes and lets the music do the talking.